"Once again, soprano Janeanne Houston and pianist Robert Jorgensen have collaborated on an exemplary collection of modern art songs, featuring the work of some of our finest current composers…these are approachable, accessible songs that are highly expressive and largely tonal. And yet this does not feel like a safe or especially conservative collection...."
All of the songs and cycles on this recording are world premiere recordings, with the exception of Lee Hoiby’s Wild Nights, and There Came a Wind like a Bugle, which were recorded by Leontyne Price on her Live From Carnegie Hall album. The performers wish to express their deepest gratitude to these extraordinary composers for their phenomenal music, for working with us at times in its preparation, and for giving us their blessing to record this music for the first time. 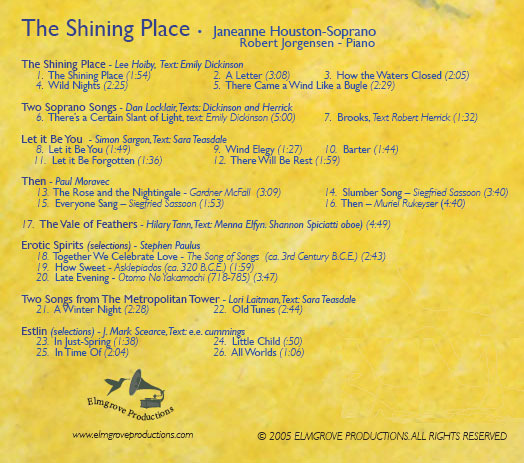 The Shining Place was recorded on location in Pacific Lutheran University’s Lagerquist Concert Hall, July 18, 20, and 22, 2005.